When the Iron Belle Trail was first proposed by Governor Snyder in November, 2012, the idea was met with mixed reviews. Many were delighted at the prospect of a continuous north-south trail across the state (especially 1 hiker who actually traveled it!) even before they knew its exact route. On the other hand, there will always be trail naysayers. (For one or another reason, they refuse to acknowledge the significant economic, health, community-building, transportation, and conservation benefits that overshadow their opposition!) 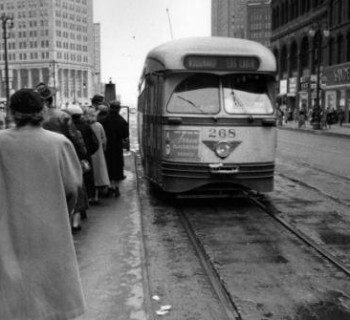 But beyond those that are the hardened opponents, there were still those that argued about this gigantic trail overshadowing other trail connection efforts, such as closing the gaps on another cross-state trail, known as The Great Lake to Lake Trail, Route 1 from South Haven to Port Huron. Now, two years later, we know a lot more about the Iron Belle Trail and the great benefits it will provide for Michigan. The Iron Belle Trail is more than a single route from Belle Isle in Detroit to Ironwood; it is actually a set of two separate paths. The biking route utilizes many of the state’s existing bike paths, bike lanes, and signed, designated biking routes as it travels up the east side of the state, while the hiking route utilizes sidewalks, trails, and the 1,000 mile+ North Country National Scenic Trail traveling up the west side of the lower peninsula. State and federal agencies are working with communities and citizens all along the route to complete it. You can get a detailed map of the route and the status of the trail at www.michigan.gov/dnrtrails; just click on the Iron Belle Trail icon. Not only is this a trail attractive to the areas of Michigan it traverses, the Iron Belle Trail as a major “destination” trail, will stir wanderlust for trail users across the country. While Michigan already has the most rail-trail miles as well as the greatest portion of the North Country National Scenic Trail among the 7 states it crosses, the fact that this mega trail ties these two efforts together, results in a seamless grand showcase of Pure Michigan landscapes. For example, trail users can visit Detroit’s new neighborhoods, complete with food and entertainment delights, take in the expansive views and fresh products of our fertile farm country, relax along rivers, lakes, and streams, and finally, make their way through unspoiled wilderness before coming to the end of the trail in Ironwood. The hope is to get the trail substantially on the ground within the next few years, and that is why there is an influx of trails expertise and funding currently focused on this effort. Communities in the gaps who previously had no trails are now in the process of planning their segment of the Iron Belle Trail. The benefits of trails for walking and biking will be extended to even more of Michigan’s populace, which is a very good thing! 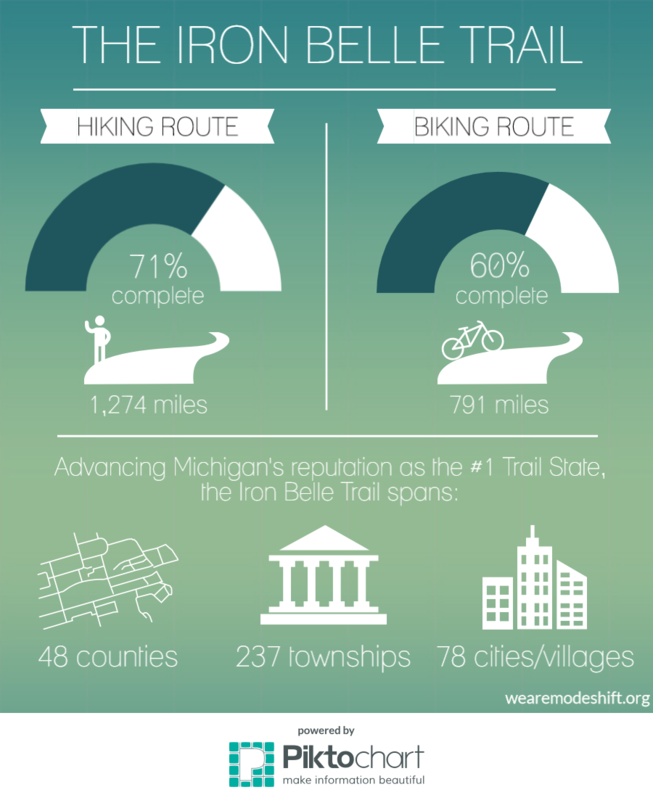 So, while the Iron Belle Trail has raised skeptics' eyebrows, it has also kindled inspiration and collaboration across many trail groups and layers of government, and will, in our estimation, do more to advance Michigan’s reputation as the #1 Trail State than any other trail project has. 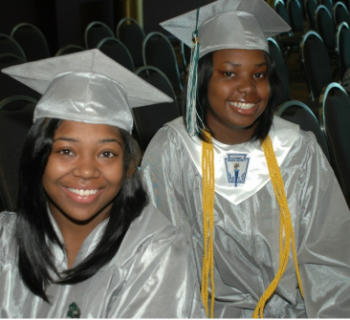 And as Michigan continues down that path to make it happen, happy trails! 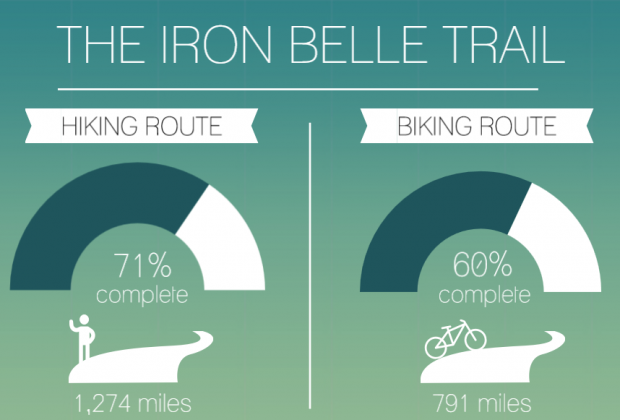 Did you know you can already take part in events along the Iron Belle Trail? The Michigan Trails and Greenways website at features a calendar of trail events. The events marked with the Iron Belle Trail logo highlight activities taking place along various existing segments of this grand trail. You can run, bike, hike, or cross-country ski on over half of the trail already! Infographic: What Makes A Bicycle Friendly Community?